There are few things as impressive as seeing a Titan on the tabletop. Seeing one made of cardstock makes it all the more impressive. These pics came from fellow hobbyist Bill who was kind enough to share them with me. They are just too good to keep to myself. Two years to the month after starting this project, I am calling it done. I am probably going to change out the missiles, but aside from that, it is complete. 23" tall x 15" x 15". 10. Cut and added launch tubes to the missile launcher and added missiles. Originally this was going to be an "out of the box" build. 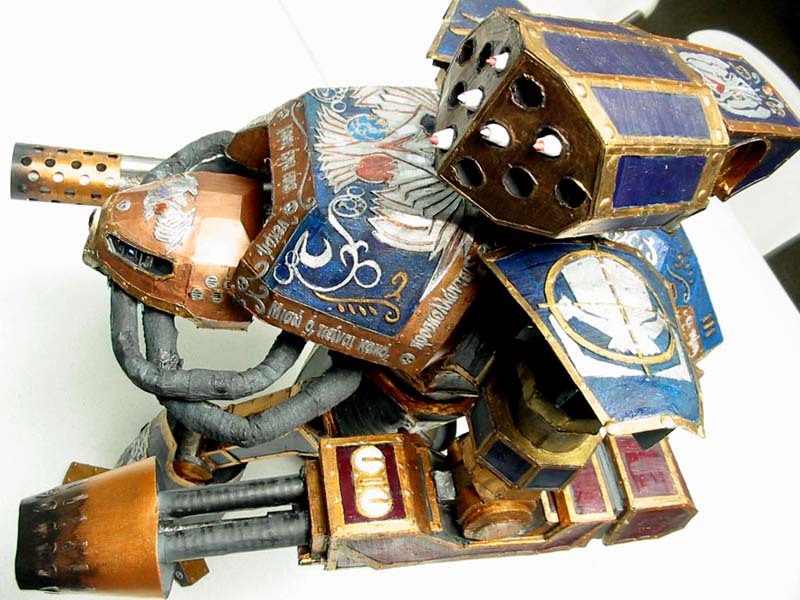 Just a quick build of JSV's DIY Reaver Titan from BWC Archive...the only problem was my inability to leave well enough alone. It all started with building the feet and thinking, "It would be cooler if I just added raised surface detail," and so on. Well, needless to say, it became an exercise in creativity (and sometimes endurance - sanity went out the door long before the start of this project). 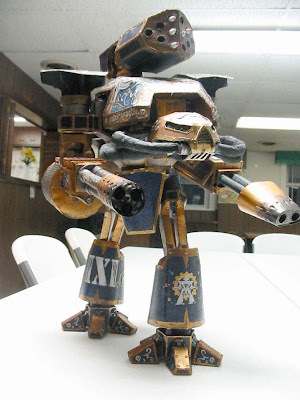 So often I see people posting about making this and other large kits out of plastic as opposed to trying to make it out of paper and cardboard. My thought was that if you wanted to take the time, it could all be done in paper. Also, not everyone on a group or forum may have access to the materials others have, but everyone can get their hands on paper and glue. The secondary purpose for this project was to test out whether a paper model this big could be made completely out of paper, stand under it's own weight and look really cool doing it. I believe the answer is yes on all three counts, but were I to do it again, I would probably redesign how the toes are joined to the foot, reinforce the knee and redesign the hip assembly. Although the time spent two years, part of that time was figuring out how to accomplish what I wanted to do. Specifically the thigh and hip assembly which went through several design/build/redesign iterations to get the final result. A happy unintended result is that it looks like it is stalking rather than static. This is one of the few projects I have done where I can look at it from any angle and think,"that's so cool!" A huge thanks to Bill for sharing these with me. Talk about an inspirational model! It just goes to show that this kind of thing can be done if you're willing to invest the time and effort into it. I've built a Titan before, but it was a Forge world model and that was a huge undertaking. I can only imagine what it would be like to try and do this by scratch. That's awesome Bill! There's only a few places where you actually notice that it's made of cardstock. I really like that shade of blue and the freehand you did on those sections. Kudos to Bill, that's one heck of job he did there. The extra scroll work and designs on the armor really put this model over the top. Great job. 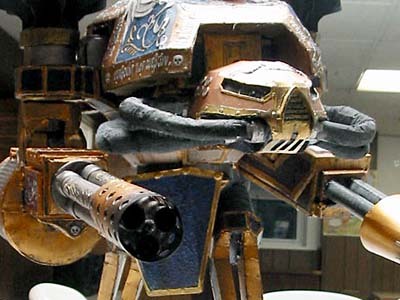 That's pretty darn amazing, and from cardboard too? Wow. From card? Astonishing! It looks very good. Oh nice! That is just what I need to see to motivate me to continue work on my Scratch built thunderhawk (http://40kressurected.blogspot.com/2012/08/development-of-thunderhawk.html) Does Bill have a website or album of more images of that monster? 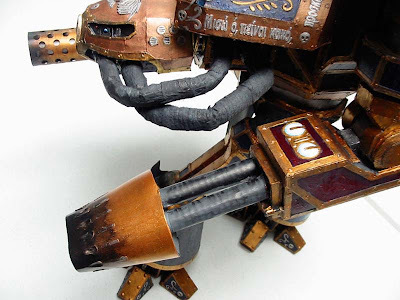 Awsome detail work on the top armor bill, looks great, cant wait to c more. I'll toss in my two cents as well... it's the extra details that do it for me. The freehand like Reid mentioned and the scrollwork like Gary brought up. It's those little details that bring the model up to the next level. Tempest: Holy Cow! That thing looks amazing. The detail on the feet is wonderful so far. He'll look even better once you get towards the end and start in with all the smaller details. 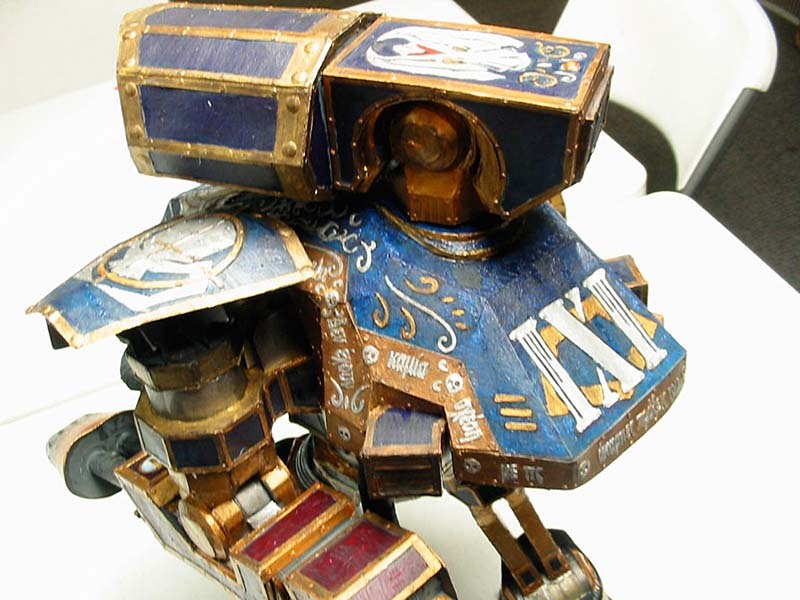 Here's a tidbit if you want to make your armor look like cast metal (like the carapace, grieves, and pauldrons): Get some artists' gel medium from an at an art supply store, mix in the citadel or other paint of your choice, stipple it on, let dry. It makes a really cool prismatic color effect (which I killed wen I weathered it down >sob!<).